Though attacks within Baghdad city are generally associated with the Islamic State (IS), particularly when it comes to coordinated car bomb attacks in multiple neighborhoods and other sophisticated assaults as we saw recently in al-Kaẓimiya (and the ascription is not incorrect) there are some minor Sunni insurgent groups that also carry out attacks in the Baghdad urban area, primarily in the form of IEDs and assassination operations: some of these acts, to be sure, are claimed by the more recognizable brands like the Islamic Army in Iraq. 'Truly has God purchased from the believers their souls and wealth for the fact that those who fight in the path of God are assured Paradise: they kill or are killed; it is the true promise on Him in the Torah, Gospel and Qur'an, and who is truer in his pledge than God? So rejoice in the pledge you have undertaken: and that is the great attainment' (Qur'an 9:111). The years of the evil American occupation passed, and it withdrew in defeat bearing the consequences of failure and loss, after it had destroyed the country, humiliated the God-fearing, and corrupted livelihood and the markets- besides insulting customs and infringing on taboos- but also after it had tasted humiliation and degradation and lived days stained with blood and filled with terror at the hands of the heroic mujahideen in our beloved land of Iraq- the Iraq of glory and civilizations. After the American occupier fled from our land, it left behind another enemy more resentful and offensive towards the Ahl al-Sunna, many of whom thought that the withdrawal would mark the end of pain and suffering and the start of a new life filled with freedom, security and stability, but one does not see the truth except he who has lived through its chapters and been through its paths. The Americans have gone and the Safavid Iranians and their followers, who came for the first time with the occupation, remained, so that the Ahl al-Sunna might live the painful truth which is that there is no difference between the two states if the more recent one is not worse. For we had with the American occupation assaults and triumphs as God blessed their execution and outcomes, thanks to God. So we intended to announce ourselves at this stage for the current state of affairs is different after the withdrawal but the enemy is more dangerous than before, from which there is a need for greater ambition and more precise operation: perhaps God will confound the mind of these criminals and bless his God-fearing believers with victory and capability. Further we have seen that claiming our military operation through media will have a greater impact on the souls of these criminals, and thus it will have a good impact on the souls of the believers. Perhaps it will be a reason for them to seek their aspirations and strengthen their determination, with our knowledge of the difficulty of the situation and scarcity of capable hands, but it is an effort of the destitute. We ask God to bless the few and increase their number. This announcement of ours is not the establishment of something new but is rather a clear statement of a formation with a present existence and a history with the occupation and its consequences, with thanks to God and His blessing. 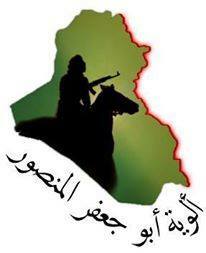 Its name is the "Abu Ja'afar al-Mansur Brigades": indeed we make clear that our work relates to the targeting of the Rafidite [Shi'a] government, the soldiers of Iran, its followers, collaborators, guardians and arms operating in Iraq- whatever type or title of their work, whether security preparations, political parties, civil/legal foundations, diplomatic committees, and all of the apostates who cooperate with them or offer them assistance, as long as they are working in the service and interest of the Safavid projects, waging war on and oppressing the Ahl al-Sunna, for our knowledge that these malicious connivers excel in disguise, under-handed dealing and deceit more than others besides them. So we will set an ambush for them by God's permission, and we will not leave a single Iranian follower moving with freedom on the Land of Two Rivers except that there will be for him for a portion of our jihad and a share of our bullets so that he will regret the day on which he thought to come to Iraq and will give up on his delusion of control in which he lives. Also we call on every eager and noble Muslim to support the mujahideen and bear arms to defend religion, soul and honour and stand up to the hateful Rafidites because they only understand the language of fear, arms, force and this is their destiny on the passing of history. And there is no use in talking or reaching mutual understanding with them, for these are the people of the religion of falsehood, deception and taqiyya [Arabic term for religious dissimulation associated with Shi'a to hide from persecution], not knowing the meaning of truth or the feel of honesty. We ask God to place us among the people of honesty and steadfastness, and strengthen our shot and make firm our feet and shake the land under our enemy. O God, ruin Iran, its allies and followers; cut their limbs, sever their arms; disperse their fathering and scatter their union. O God, allot them their share in numbers and kill them as they disperse and do not spare any of them. To accompany this announcement, the Abu Ja'afar al-Mansur Brigades also gave an account of operations prior to this announcement, centered on the Baghdad area, from December 2011 (marking the completion of the U.S. withdrawal) up to the end of June 2012. The only exception is an attack claimed in Karbala in June. 22 December 2011: targeting of an Idolatrous Guard [i.e. Iraqi army] soldier: Sadr City. 27 January 2012: wounding of one of the commandoes: al-Za'afraniya. 18 February 2012: targeting of a member of the Presidential Guards: al-Dura area [south Baghdad]. 25 April 2012: killing of an evil Rafidite: al-Wahda quarter area [east Baghdad]. Subsequent attacks claimed by the Abu Ja'afar al-Mansur Brigades follow a similar pattern: the vast majority of them taking place in these familiar Baghdad areas but occasional attacks outside the capital. For example, on 5 July 2012, the Abu Ja'afar al-Mansur Brigades claimed rocket attacks on a federal police base in Samarra. On 2, 8 and 20 September 2012, the group claimed attacks on the police and army in Mosul. However, the frequency of these attacks outside the Baghdad area compared to the recurrences within Baghdad are not enough to suggest a centralized command structure on a nationwide scale, though coordination and organization are definitely in evidence within Baghdad. "In the first response to the Hawija massacre against our people, God granted for your mujahideen brothers to target the Safavid Tigris Operations Command base in Kirkuk province with three rockets from al-'Amal ash-Sha'abi area, 23 April 2013." "Oh you who believe, take your heed and either go forth in groups or go forth all together"- Qur'an 4:71. You have followed the recent statements of al-Haliki (Maliki) and have seen the movements of his camps and soldiers in Anbar which have also made clear that the enemies of God have gathered their resources to launch a wide-scale attack on the people of Anbar and liquidate the mujahideen and all who preceded them in jihad and influence from among the devoted truth-tellers. The criminals continue after a year of the peaceful protest movement to be terrified of the throats of the demonstrators that made their beds rough, for lo, how in anger they bore their arms to put a stop to the daily series of humiliations? It has been taken as a given that oppression and tyranny are only stopped by armed jihad. We remind you of the words of God Almighty in the ruling of His revelation: "And fight in the path of God those who fight you"). Oh dear youth of Islam: seek the help of God- Him alone- and strive to train small groups to strike the Safavid forces in all areas and divide and break up their military forces. All reckoning is on His power, for indeed that is the best of plans in these circumstances- that we my cleanse our Sunni areas of their oppression and filth"
27 August 2014: killing a member of the Safavid army on al-Tabrid street in White Castle area, Baghdad. 28 August 2014: killing a member of the criminal SWAT forces in Sheikh Omar area, Baghdad. 2 September 2014: killing a member of Asa'ib al-Batil [Asa'ib Ahl al-Haq] near the group's office in central al-'Aẓamiya, Baghdad. 11 September 2014: sticky bomb on a car belonging to Muqtada's army in al-Mushtal area in Baghdad. 14 September 2014: killing of a member of Asa'ib al-Batil near the Uqba ibn Nafil Square in Baghdad. One possibility that explains this gap is that those claiming membership of/affiliation with the group outside of Baghdad may have been subsumed by IS in multiple areas, and so it has now been pushed back to its main area of operations: if so it should perhaps not come as too much of a surprise given the overlap of stringent anti-Shi'a sentiment, and the Abu Ja'afar al-Mansur Brigades' own evocations of a Caliphate with its name. One source I know from Baiji, for example, denies the presence of the Abu Ja'afar al-Mansur Brigades, even as he acknowledges other factions in the wider area like the 1920s Revolution Brigades and the Islamic Army in Iraq. In western Anbar localities like Rawa and Anah, where the group had previously claimed operations, there cannot be a visible presence as these places are solely controlled by IS. Likewise, the city of Mosul has come to see IS assert its power at the expense of other insurgents. In any case, considering that IS is unable to conquer Baghdad and the wider Sunni insurgent dream of taking the city will remain for some time, one can expect the Abu Ja'afar al-Mansur Brigades to continue to claim operations in the Baghdad area.